Tim Frazer is an agent with an unnamed British Intelligence agency. An engineer by training and by trade, Frazer was educated at a moderate English public school. He was mediocre in most subjects with the except of languages and metal works so he made his profession that of engineer for a company assigned to the Middle East. A bequeath of a small machine-tool business near London brought him back. A chance meeting with a glib speaking Harry Denston resulted in Frazer having a partner and for a few years business was good. Then the free-spending of his partner brought the shop into receivership and Frazer was back working for others again. Months after the company went under, Frazer received a mysterious call from his old partner who excitedly told him their troubles were over if Frazer would just join him in a seaside village for an important meeting. Reluctant to take the time but anxious to get back some of what was owed him, Frazer agreed. And thus was his introduction into the shadowy world of Intelligence. 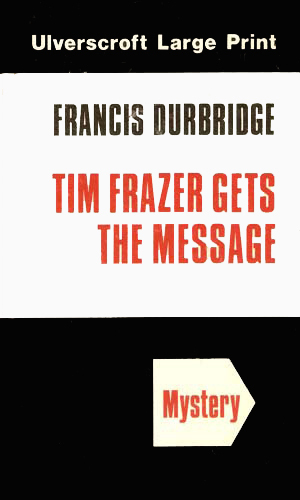 Francis Durbridge was a very successful radio and television writer and producer, having already struck success with a popular private detected named Paul Temple. He had added to the success by penning a series of novels based on the radio plays. His success gave him the opportunity to try other ideas, one of which was that of a everyman character getting involved in the spy business, more specifically, catching spies. Though the agency for which the character would eventually work was never mentioned, it was patterned after MI-5. There is little doubt that part of the reasoning for a spy versus detective show had to do with the success of a rival network's Danger Man series. In November of 1960, The World Of Tim Frazer made its television debut. Starring veteran British actor, Jack Hedley. The stories were told in serial form lasting 1/2 hour each on BBC1, the primary British channel at the time. Each assignment lasted six episodes, making a total of 18 shows in all, a record for serial programming up to that time. Due to his heavy work load, Durbridge was unable to provide all the writing for this series like he had for the Temple show and others he had produced so he brought in two television writers, Clive Exton and Barry Thomas, to help but it was still Durbridge who set the tone and direction. Just as he had with the other shows, Durbridge found the time to novelize the stories into book form, creating the three-book series mentioned here. The first two books came out originally shortly after the series went off the air. The third and final one, however, has a copyright date of 1978 making it unclear whether it came out with the others or more than a decade later. Of note is the fact that the television series proved quite popular all across Europe, especially in Germany, making it a wonder that it didn't continue beyond the initially planned 18 episodes. When his former business partner calls out of the blue with a promise of a chance to get out of debt, Tim Frazer drives two hours to a coastal village only to find the man missing and himself offered a job to help solve several mysteries. The 6-part episode had the same name. From the 6-part series entitled The Sallinger Affair, an agent with the Department is killed in Amsterdam and Frazer is sent to find out if it was an accident or murder. From a 6-part serial called The Mellin Forest Mystery. Tim Frazer again looks into a murder in Wales, this time of a female agent just back from assignment in Hong Kong. Besides finding out who killed her, Frazer must discover why she was in that region to begin with. Acting on a hunch, Tim Frazer travels to the small fishing village of Henton hoping to find his former partner, Harry Denston, and get back what is owed him. As he tries to understand his partner's vanishing, a Mr. Ross from 'the Government' offers him a job to find the same man. A clue leads him to Talltree Cottage where he meets Anya. A man named Tupper asks to buy Harry's car from Tim Frazer. Heading home, Frazer find a man stabbed to death. Still looking for answers, Tim Frazer heads back to the inn in the village and receives a call from his old partner. A woman at Talltree Cottage admit she knows something about Harry. Tim Frazer heads there to talk but finds a car accident with the woman as a casualty. Getting desparate for information, Tim Frazer forces Harry's fiancee to tell him where his partner is hiding. As he concludes his hunt for his partner, Tim Frazer is given a new assignment which involves a boat ride to Holland. Onboard the boat is his old partner. Tim Frazer is told to follow a woman named Barbara Day who was the driver of a car which hit and killed one of Ross's agents in Amsterdam. Frazer is still certain that Barbara is innocent but then a friend of hers is murdered and he starts to wonder. To find out who is the head of a diamond smuggling gang, Frazer allows himself to be mistaken for someone else and go undercover. Tim Frazer gets a strange call warning him to 'skip the coffee' and then he is invited out for coffee by Barbara. Undercover, Frazer sells diamonds to the smugglers all to find out who is the boss but the man he uses as a go-between is hurt in the process. Tim Frazer has discovered the facts on the diamond smuggling and ends the assignment. Immediately he is given another - to find out who killed a woman working for Ross and why was she not in Hong Kong as expected. Tim Frazer continues his investigation into Miss Thackeray's murder. Learning of a cottage that the murdered woman was interested in, Frazer checks it out. On the way back, he finds the murdered body of the estate agent who told him about it. Frazer comes upon yet another body, this time the Estate Agent's secretary. Frazer's investigation into Thackeray's murder is getting someone very nervous and he gets a call for a meeting with a mysterious person. Tim Frazer has figured out why Miss Thackeray died and more importantly, who killed her. Unfortunately, the killer knows he knows. Tim Frazer is definitely an "everyman" character. He has no training as a spy-catcher and certainly no background at it but he has an inate sense of people and a determination that keeps pushing him. He does seem a bit unpreturbed when faced with sudden danger, making you wonder how he could not be concerned. The product of the 30-minute teledrama, I suppose. If the show had come out five years later, I suspect, his character would have garnered no attention at all as the age of the dashing hero had come into vogue but for his time, he was what people felt comfortable with. He was them, only braver and more capable. 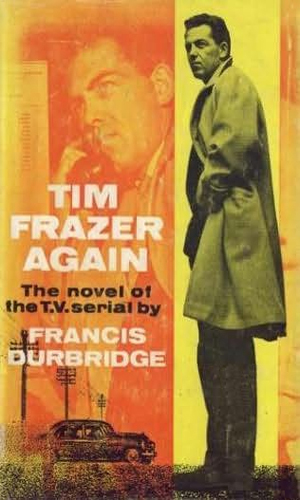 I agree with your comment that a few years later, and Frazer would have slipped by unnoticed, but his everyman character was just right for that period - you only have to look at late fifties/early sixties Brit crime movies,TV and books to see that it was the film version of Bond that changed things, rather than the print version. 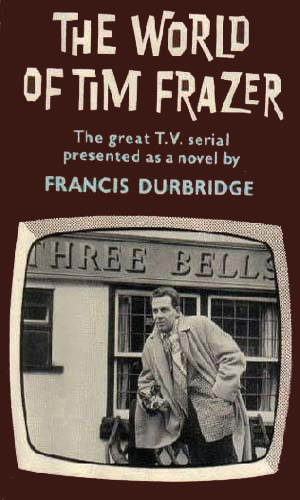 But back to Frazer - I like these because they are so matter-of-fact - Durbridge was a brisk writer whose work was all in that vein, and although some of the later novelisations were apparently ghosted, and were a bit rough around the edges, the earlier prose that was down to Durbridge alone is excellent of its type. His mysteries are very good, and if you like the down to earth pre-LeCarre spy, the these hit the spot.